Theresa May was dramatically confronted by MPs today as they accused her of bluffing over threats of no deal Brexit. In brutal clashes with a powerful Commons committee, the PM insisted contingency plans for crashing out of the bloc will have to be activated if Parliament rejects her package in a crunch vote on December 11. But Labour’s Yvette Cooper said she did not believe Mrs May would follow through on no deal after the Treasury and Bank of England set out a doomsday scenario for the consequences. She said Mrs May ‘not the kind of person’ who would inflict that outcome on the country. ‘I don’t think you will do it,’ she jibed. The stormy exchanges came as the government tries to step up the pressure with less than a fortnight to go before the titanic Commons showdown on her plan – and Mrs May seemingly on course for disastrous defeat. The premier appealed for MPs to ‘focus on the choice that lies in front of them’, insisting her settlement with Brussels ‘delivered on the referendum’. She warned that Tories condemning the deal had to be aware that there are ‘some members of Parliament who do not want to leave the EU’. But she insisted she was determined to stick to the Brexit date of March 29 next year. The session came after the government dramatically stepped up its campaign to force the settlement through yesterday by publishing grim figures about the impact of ‘no deal’ – while Bank of England governor Mark Carney warned that the Pound would plummet, inflation would spike, and unemployment would soar. But the estimates infuriated hardline Brexiteers, who branded it ‘Project Hysteria’. And Remainers seized on the dismal projections for all Brexit options to say the whole idea should be abandoned. The Commons Liaison Committee includes senior figures from all sides of the argument – meaning Mrs May was always in for a rough ride. Bank of England chief Jay Carney yesterday warned the pound would crash, inflation will soar and interest rates would have to rise in the event of a no deal disorderly Brexit. Bank Governor Mark Carney said the impact of Brexit would depend entirely on whether there was a deal but said he had a duty to spell out what might happen. But he faced a backlash from Eurosceptic MPs, who accused him of mobilising ‘Project Hysteria’ in support of Mrs May’s deal. She added: ‘Even if you don’t get this deal, don’t think you will do it. I think you will take action to avert it. After Mrs May said she was committed to getting her deal passed, Ms Cooper accused her of ‘not being straight with people’. Mrs May dodged when asked if she would press ahead with no deal Brexit if MPs vote down her package. But she insisted the government had been making detailed preparations in case the UK does crash out – and suggested those plans and businesses’ contingencies will need to be triggered if her package is not passed. ‘If the House votes down that deal at that point, then there will be some steps that will be necessary,’ Mrs May said. ‘Obviously we have been doing no-deal planning as a government – we have made certain information available to businesses. ‘If the House were to vote down the deal that has been agreed – given that the EU has been clear that this is the deal that has been agreed and this is the deal that is on the table – then obviously decisions would need to be taken in relation the action that would need to be taken. 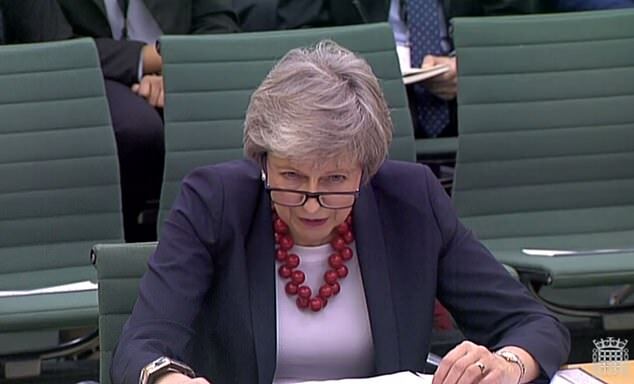 ‘The timetable is such that actually some people would need to take some practical steps in relation to no deal if the parliament were to vote down the deal on the 11th of December,’ she said. Mrs May batted away questions about whether the government could get behind a second referendum or try to renegotiate if her deal is sunk. ‘You want to look at all sorts of options and ideas. I think it is important Members of Parliament focus on the nature of this vote,’ she said. ‘This is an important point in our history. It is a vote on which we will be deciding whether we deliver on the decision of the British people. The appearance comes as Labour threw down the gauntlet over Mrs May’s EU withdrawal agreement by tabling an amendment opposing the deal ahead of a Commons showdown in 12 days’ time. DUP leader Arlene Foster also upped the ante today by warning Mrs May not to ‘waste time’ trying to force her deal through. But Mrs May tried to play down the idea that the Tories’ confidence and supply deal with the Northern Ireland party – the only thing that give her a majority – was effectively over. ‘Actually, the DUP have themselves said that the confidence-and-supply agreement remains in place,’ she said. There was some slightly better news for Mrs May today as Commons Leader Andrea Leadsom – who had been put on resignation watch by No10 – explicitly backed her plan. Mrs Leadsom, the ring-leader of a so-called ‘pizza club’ of pro-Leave Cabinet ministers, who held informal meetings to discuss their response to withdrawal plans, backed Mrs May’s deal. In a letter to constituents Mrs Leadsom said it had been a ‘challenging journey’, but the PM’s plan was the only deal on the table and meant the UK would quit the bloc next March, the newspaper said. Awkward moment MP joked about being ‘friends with benefits’ with the EU… but did Theresa May get it? 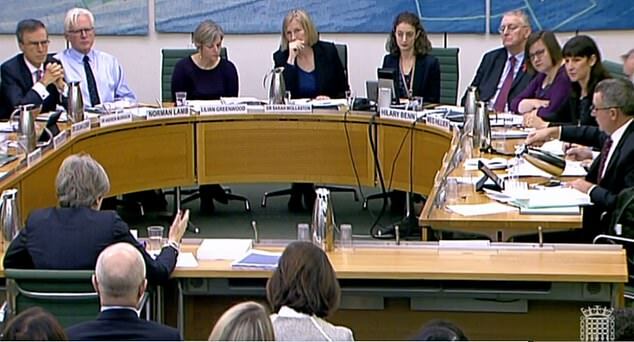 The Liaison Committee hearing descended into farce today after an MP made a smutty joke. 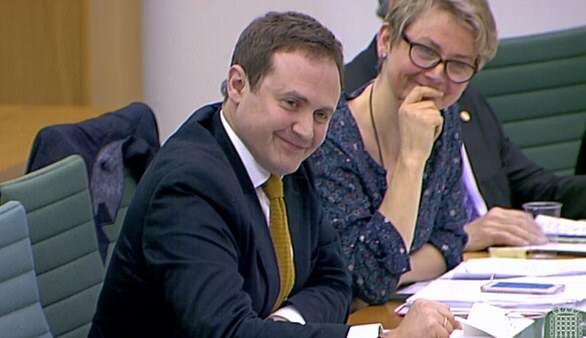 Tory Tom Tugendhat was questioning Theresa May when he asked if her vision for relations with the EU amounted to ‘friends with benefits;. The remark prompted the room to dissolve into giggles. But a bewildered PM – who is known to have a bawdy sense of humour on occasions – said she had not caught his ‘quip’. After Mr Tugendhat repeated the line, she laughed but seemed eager to gloss over the innuendo. Instead she repeated her mantra that her Brexit package was the best available for the UK. The intervention came as the Government confirmed MPs will debate the Brexit deal eight hours a day for five days leading up to a crunch vote on December 11. MPs will be allowed to vote on six amendments to the Government motion backing the deal during the Commons showdown. Commons Speaker John Bercow will decide which amendments get to be debated and decided upon by MPs ahead of the so-called meaningful vote on Government proposals. Labour leader Jeremy Corbyn, who is appearing on ITV’s This Morning today to push his case, said the party could not back Mrs May’s plan as it failed to ensure participation in a ‘strong’ single market and customs union. The move came as Labour signalled a new referendum would be inevitable if Mrs May’s plans are voted down. Reiterating that her party’s 10 MPs would not support the Prime Minister’s Withdrawal Agreement when it comes to Parliament, Ms Foster said it would create a ‘huge democratic deficit’ in Northern Ireland. Speaking to BBC Radio 4’s Today programme, Ms Foster said the current proposals contain ’68 pages of regulations that will apply to Northern Ireland and will not apply to the rest of the UK’. ‘There is a huge democratic deficit coming our way if we agree to this deal, because we’ve no say over the rules that will apply to Northern Ireland,’ she added. What happens now the Brexit deal has been signed off in Brussels? Theresa May passed a milestone in the Brexit process by agreeing a package with the EU. But there is still a long way to go. December 11: The meaningful vote itself. This is the absolutely crucial moment and could make or break the Prime Minister and her deal. MPs will vote after a debate that could last as long as five days. If the vote carries, Mrs May survives and Brexit is on track as she plans. If she loses, she could resign. December 13-14: The next EU summit. If the deal has been rejected by MPs, Mrs May could use this to try and secure new concessions. January 2019: The European Parliament is due to vote on the deal – but will only do so if it has been agreed in the House of Commons. March 29, 2019: Exit day. This is written in law so unless there is a dramatic shift Britain will leave the EU, deal or no deal. The comments followed a warning from the Bank of England that without an exit deal the UK could be tipped into a recession worse than the financial crash, with an 8 per cent cut in GDP, unemployment surging by as much as 7.5 per cent and house prices falling by almost one-third. Also a cross-Government analysis found the UK economy would be 9.3 per cent smaller after 15 years if Britain leaves without a deal and falls back on World Trade Organisation rules, compared with remaining in the EU. While the UK economy would continue to grow after withdrawal, Britain would be worse off under any Brexit scenario than if it stayed in the EU, the Government paper found. There could be further stark warnings later, when the Commons Treasury Committee publishes the Financial Conduct Authority’s analysis of the Brexit deal and political declaration. But arch-Brexiteer Jacob Rees Mogg was dismissive of all the claims, telling the Daily Telegraph: ‘This is Project Hysteria. ‘Before the referendum we were threatened with a plague of frogs. ‘Now they warn of the death of the first born. Pro-Europe Tories hit back with former minister Jo Johnson urging party colleagues to vote down Mrs May’s deal. The ex-minister, who is brother to leading Brexiteer Boris Johnson, is using a speech on Thursday to say that if the Conservatives do not change course they face a bigger electoral defeat than 1997. And security minister Ben Wallace will say that a no-deal Brexit would leave both the EU and UK at greater risk. He will say on Thursday that leaving the bloc without an agreement would have a ‘real impact’ on authorities’ ability to protect the public. Theresa May has secured her deal in Brussels but her fight to get it actually in place in time for Brexit day is just beginning. 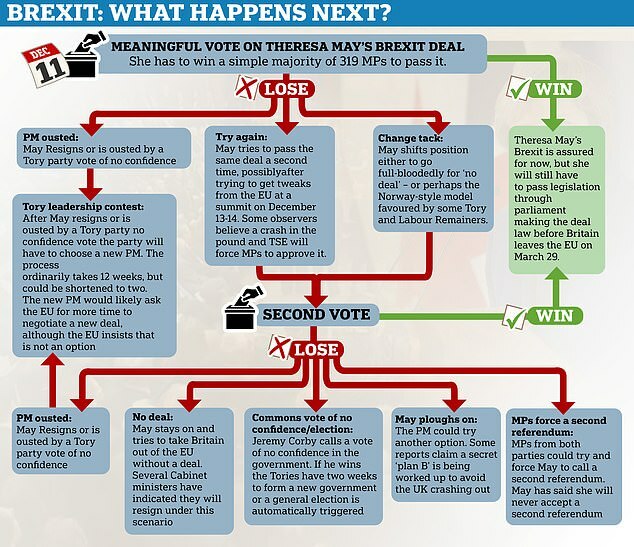 The ‘meaningful vote’ promised to MPs will happen on December 11 and is the single biggest hurdle to the Brexit deal happening – and Mrs May’ fate as PM. Mrs May needs at least 318 votes in the Commons if all 650 MPs turns up – but can probably only be confident of around 230 votes. The number is less than half because the four Speakers, 7 Sinn Fein MPs and four tellers will not take part. The situation looks grim for Mrs May and her whips: now the deal has been published, more than 90 of her own MPs and the 10 DUP MPs have publicly stated they will join the Opposition parties in voting No. This means the PM could have as few as 225 votes in her corner – leaving 410 votes on the other side, a landslide majority 185.
Who are they: All members of the Government are the so-called ‘payroll’ vote and are obliged to follow the whips orders or resign. It includes the Cabinet, all junior ministers, the whips and unpaid parliamentary aides. There are also a dozen Tory party ‘vice-chairs and 17 MPs appointed by the PM to be ‘trade envoys’. How many of them are there? 178. What do they want? For the Prime Minister to survive, get her deal and reach exit day with the minimum of fuss. Many junior ministers want promotion while many of the Cabinet want to be in a position to take the top job when Mrs May goes. How will they vote? With the Prime Minister. Who are they: The most hard line of the Brexiteers, they launched a coup against Mrs May after seeing the divorce. Led by Jacob Rees-Mogg and Steve Baker. What do they want: The removal of Mrs May and a ‘proper Brexit’. Probably no deal now, with hopes for a Canada-style deal later. How will they vote: Against the Prime Minister. Who are they: There is a large block of Brexiteer Tory MPs who hate the deal but have so far stopped short of moving to remove Mrs May – believing that can destroy the deal instead. They include ex Tory leader Iain Duncan Smith and ex minister Owen Paterson. Ex ministers like Boris Johnson and David Davis are also in this group – they probably want to replace Mrs May but have not publicly moved against her. How many of them are there? Around 50. What do they want? The ERG has said Mrs May should abandon her plans for a unique trade deal and instead negotiate a ‘Canada plus plus plus’ deal. This is based on a trade deal signed between the EU and Canada in August 2014 that eliminated 98 per cent of tariffs and taxes charged on goods shipped across the Atlantic. The EU has long said it would be happy to do a deal based on Canada – but warn it would only work for Great Britain and not Northern Ireland. Who are they: Tory MPs who believe the deal is just not good enough for Britain. They include the group of unrepentant Remainers who want a new referendum like Anna Soubry and ex-ministers who quit over the deal including Jo Johnson and Phillip Lee. How many of them are there: Maybe around 10. What do they want? To stop Brexit. Some want a new referendum, some think Parliament should step up and say no. A new referendum would take about six months from start to finish and they group wants Remain as an option on the ballot paper, probably with Mrs May’s deal as the alternative. How will they vote? Against the Prime Minister. Who are they? A newer group, the BDG counts members from across the Brexit divide inside the Tory Party. It includes former minister Nick Boles and MPs including Remainer Simon Hart and Brexiteer Andrew Percy. There are also lots of unaligned Tory MPs who are desperate to talk about anything else. How many of them are there? Based on public declarations, about 48 MPs have either said nothing or backed the deal. What do they want? The BDG prioritises delivering on Brexit and getting to exit day on March 29, 2019, without destroying the Tory Party or the Government. If the PM gets a deal the group will probably vote for it. It is less interested in the exact form of the deal but many in it have said Mrs May’s Chequers plan will not work. Mr Boles has set out a proposal for Britain to stay in the European Economic Area (EEA) until a free trade deal be negotiated – effectively to leave the EU but stay in close orbit as a member of the single market. Who are they? The Northern Ireland Party signed up to a ‘confidence and supply’ agreement with the Conservative Party to prop up the Government. They are Unionist and say Brexit is good but must not carve Northern Ireland out of the Union. How many of them are there? 10. What do they want? A Brexit deal that protects Northern Ireland inside the UK. How will they vote? Against the Prime Minister on the grounds they believe the deal breaches the red line of a border in the Irish Sea. Who are they? Labour MPs who are loyal to Jeremy Corbyn and willing to follow his whipping orders. How many of them are there? Up to 250 MPs depending on exactly what Mr Corbyn orders them to do. What do they want? Labour policy is to demand a general election and if the Government refuses, ‘all options are on the table’, including a second referendum. Labour insists it wants a ‘jobs first Brexit’ that includes a permanent customs union with the EU. It says it is ready to restart negotiations with the EU with a short extension to the Article 50 process. The party says Mrs May’s deal fails its six tests for being acceptable. How will they vote? Against the Prime Minister’s current deal. Who are they? A mix of MPs totally opposed to Mr Corbyn’s leadership, some Labour Leave supporters who want a deal and some MPs who think any deal will do at this point. How many of them are there? Maybe 10 to 20 MPs but this group is diminishing fast – at least for the first vote on the deal. What do they want? An orderly Brexit and to spite Mr Corbyn. Who are they? The SNP, Liberal Democrats, Plaid Cymru, Green Caroline Lucas and assorted independents. How many of them are there? About 60 MPs. How will they vote? Mostly against the Prime Minister – though two of the independents are suspended Tories and two are Brexiteer former Labour MPs.